Advantages: Knowledgeable contributors, superb artwork, 1:72 and 1:48 scale general arrangement drawings, A4 format well suited for image reproduction. A reliable reference source is needed for those interested in any form of aviation. 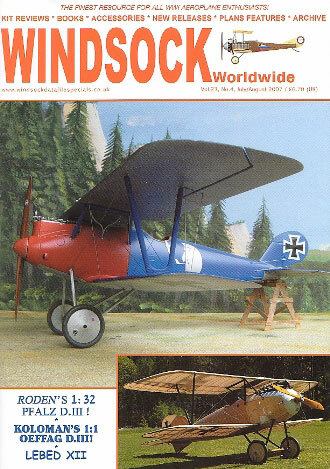 Windsock Worldwide provides such a knowledge base for modelers of World War One aircraft. This is the 4th in a total of 6 issues for this year and contains the usual variety of subject matter. George Haddow’s guide to Austro-Hungarian aircraft continues with a look at the Hansa-Brandenburg Type CC. Not only is there a selection of black and white photographs of the machine but also a set of general arrangement drawings. These are in both 1:72 and 1:48 scale. Bob Pearson accompanies the article with a lovely set of six colour profiles. Speaking of which, he also provides artwork for the Russian Lebed XII. This two-seater forms “Part 1” of an excellent contribution from Harry Woodman. Rare period images are included as well as a plans feature from the indefatigable Martin Digmayer. Once again these are represented in the two most popular scales. Roden are leading the way in large scale WWI aircraft and their latest release gets the “build treatment” from the editor. The Pfalz D.III is constructed with the aid of colour photographs and step-by-step text that describes the processes used in its construction. Ronny Bar gives two alternate colour schemes for this kit thanks to some very accomplished artwork. Colour photographs of Koloman Mayrhofer’s Oeffag D.III reproduction prove that one man’s dedication can pay off. The two page spread is only the beginning with more revealing images to follow in future editions. Normally a comprehensive roundup of kit reviews is included but it seems that lack of space has curtailed this section for the moment. Thankfully the book appraisals have remained and these keep the reader informed of new ways to part with their hard earned cash. Once again, a diverse range of material is presented to the reader. The contributors are experts in their field and the layout of material is ideal for the A4 sized format. With 32 pages contained within the covers, this magazine provides a valuable source of information for the World War One aviation modeler.